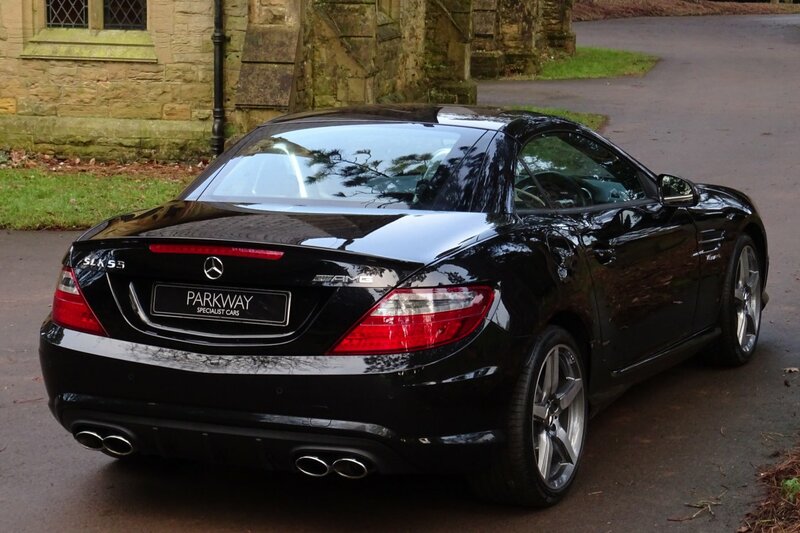 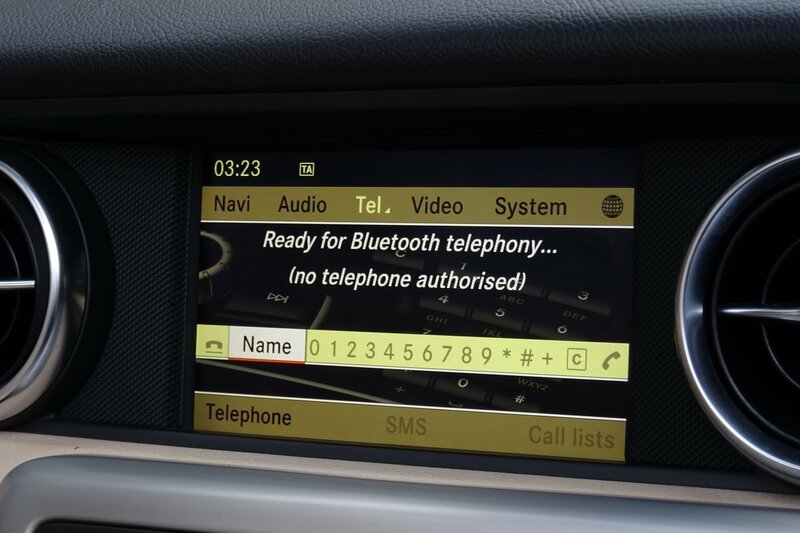 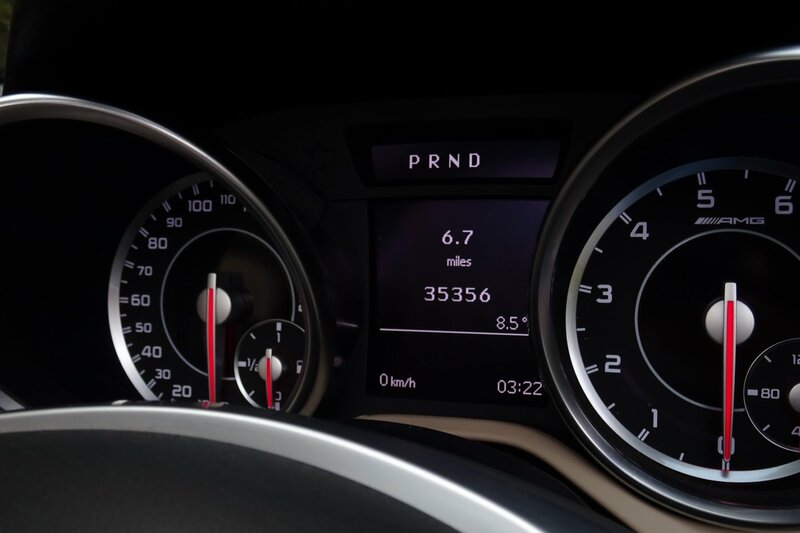 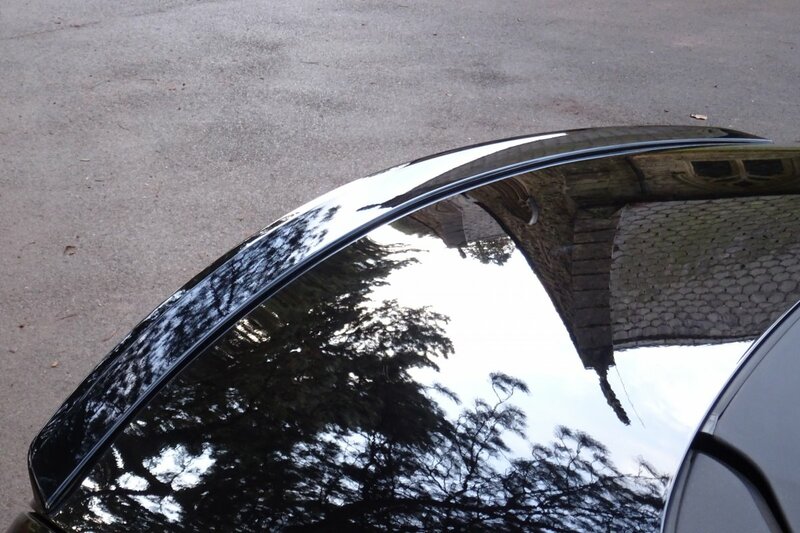 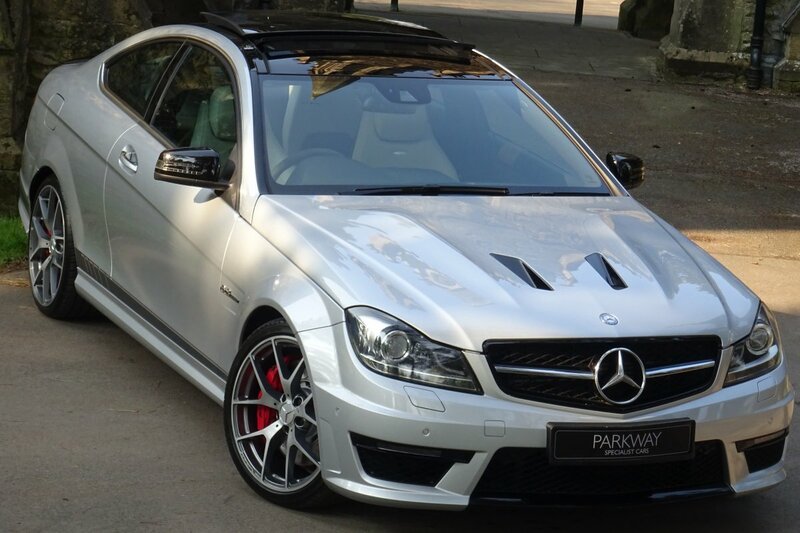 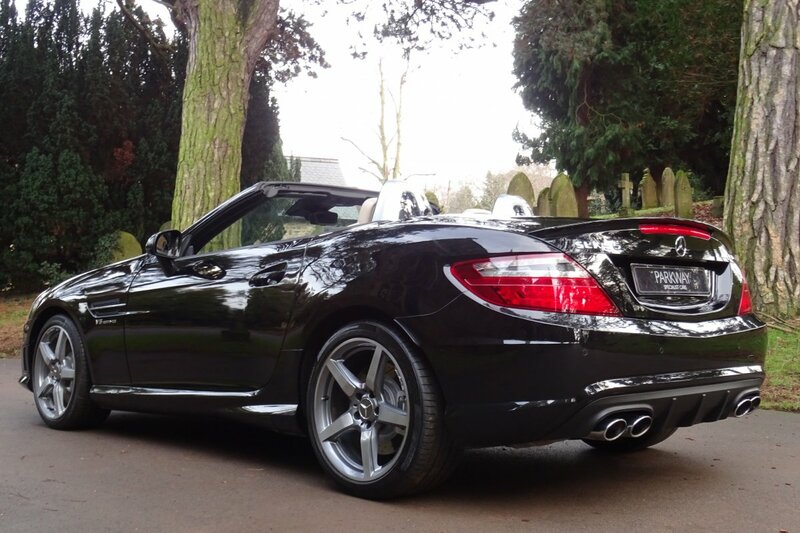 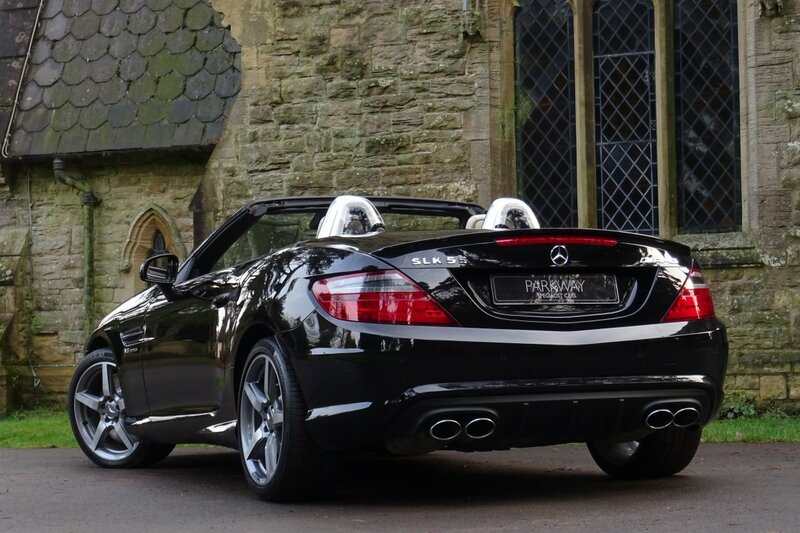 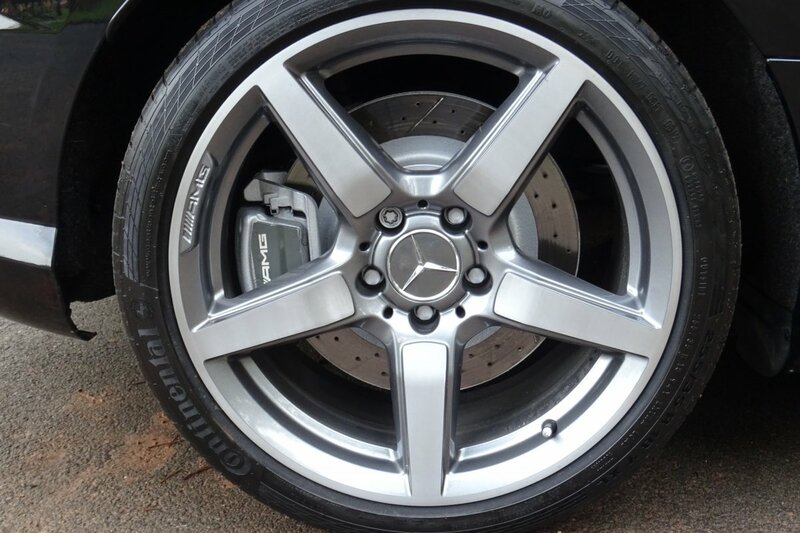 This Delightful Example Was First Supplied By Mercedes Benz In The March Of 2012. 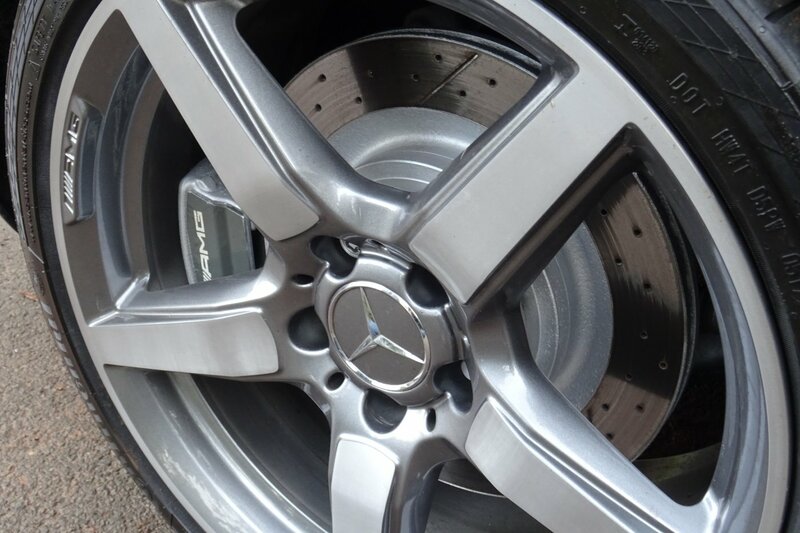 Over The Last 7 Years Chassis Number F042038 Has Had Just 35669 Miles Applied From New. 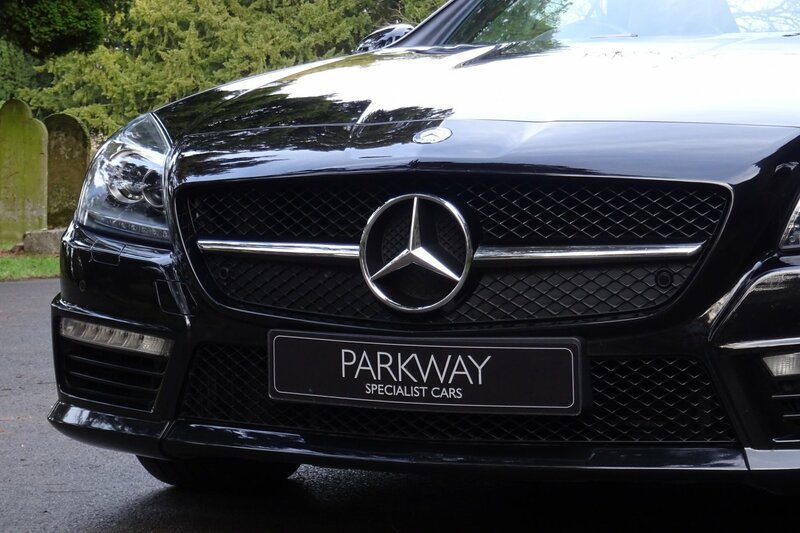 Our Example Has Been Maintained To The Highest Of Standards With Past Historical Service Visits Logged At 7362, 13559, 17161, 21707 & 28925 Miles. 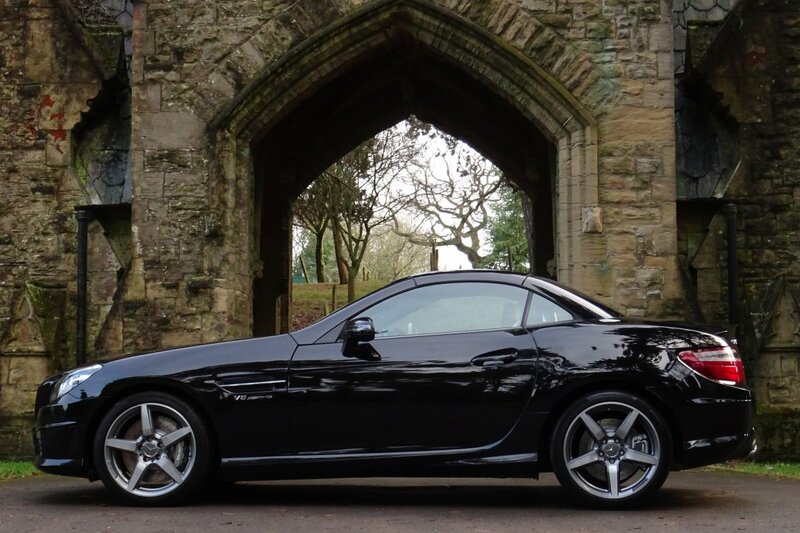 Once Sold This Lovely SLK Will Be Presented For Sale With The Entire Booklet Set, A Fully Cleared Hpi Report, A Full Factory Build Card Listing All Those Important Factory Options And A Fully Functional Key Set, All In Place For That Next Lucky Keeper To Enjoy And Cherish During Their Own Time Of Ownership. 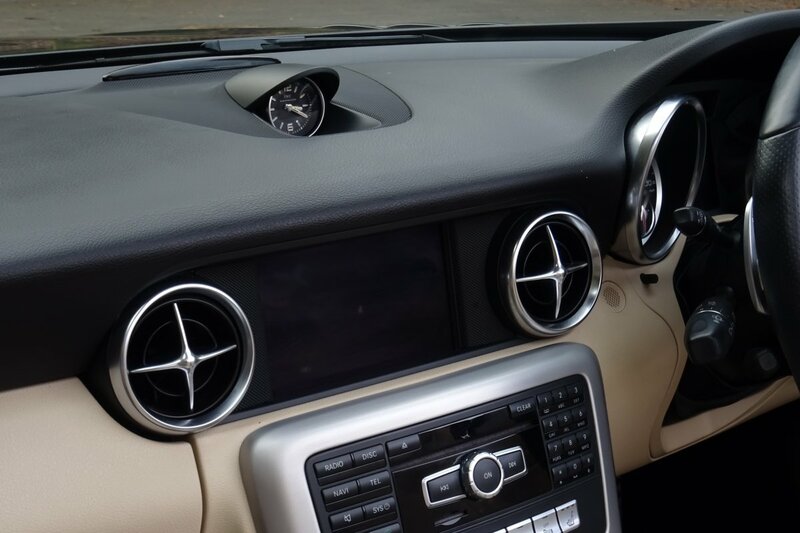 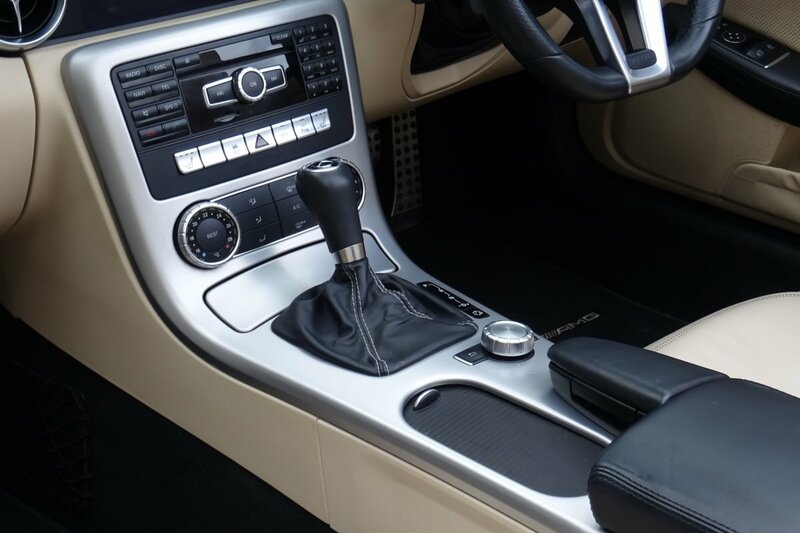 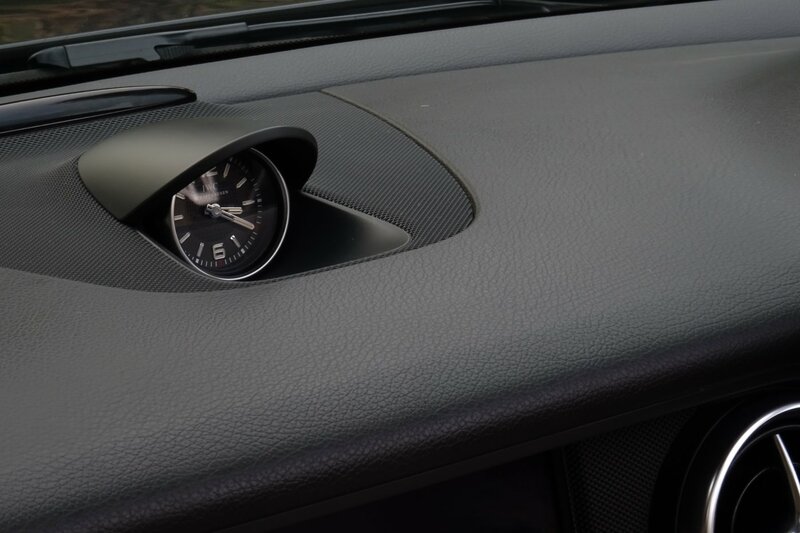 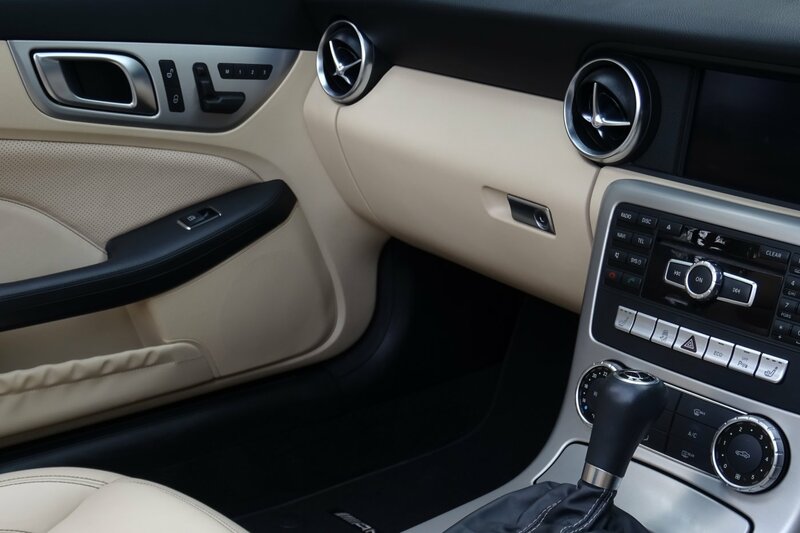 The Interior Is Very Special In So Many Ways And Offers A Cabin Of Extreme Comfort, Style And Exciting Flair For The Driver And Passenger To Enjoy Time And Time Again, No Matter The Occasion. 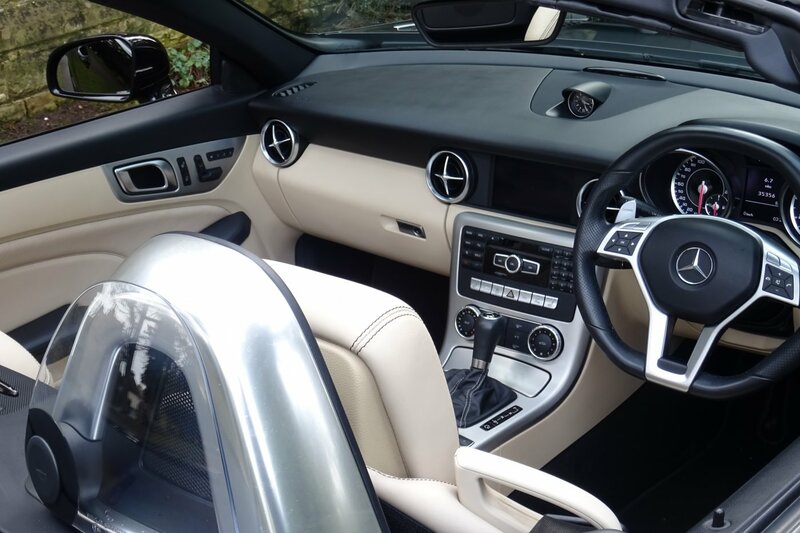 From Factory Build This Stunning Example Was Opted With Light Beige (805) Leather Sport Seats, Black Seat Belts, Black Carpets That Have Been Protected With The Mercedes Benz Over Mats, The Black And Light Beige Dash That Wraps Around This Dramatic Cabin, The Light Beige Leather And Brushed Aluminium Drivers Centre Tunnel, The Three Spoke Leather Bound Multi Functional Steering Wheel With Paddle Shifts, Dark Grey Driver Dials, The Light Beige Leather Trimmed Door Cards With Black Leather Arm Rests, The Black Fabric Wind Break Stop, The Black Fabric Roof Lining And Decorated With The Aluminium Internal Inlays, That Further Complement This Stunning Environment Off Perfectly. 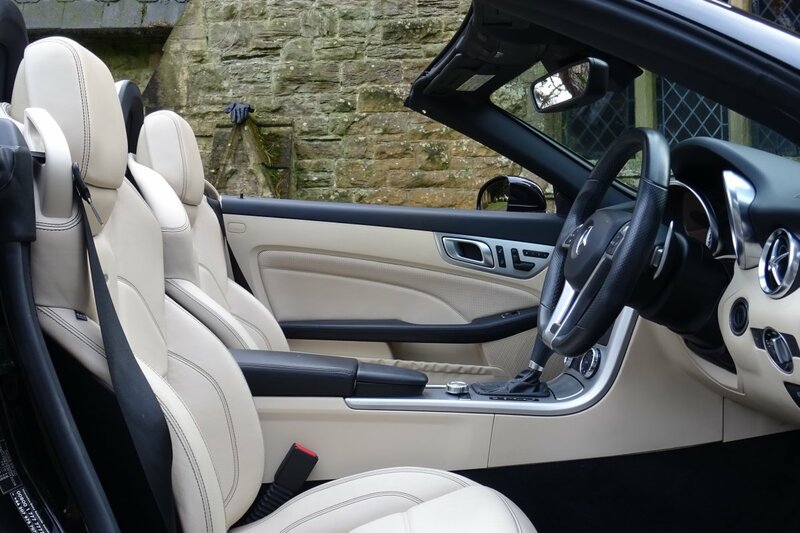 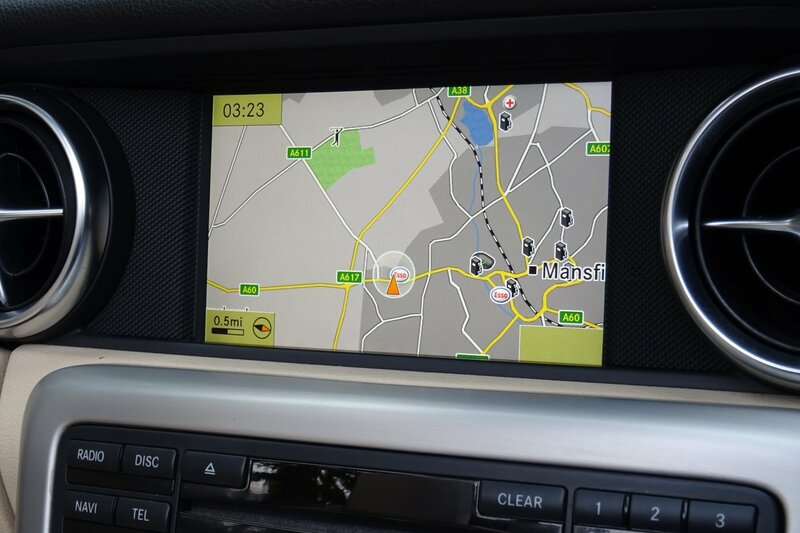 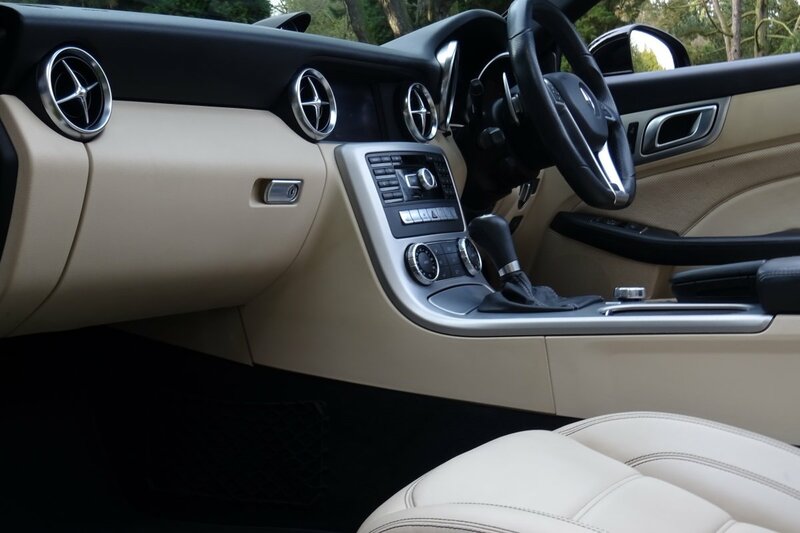 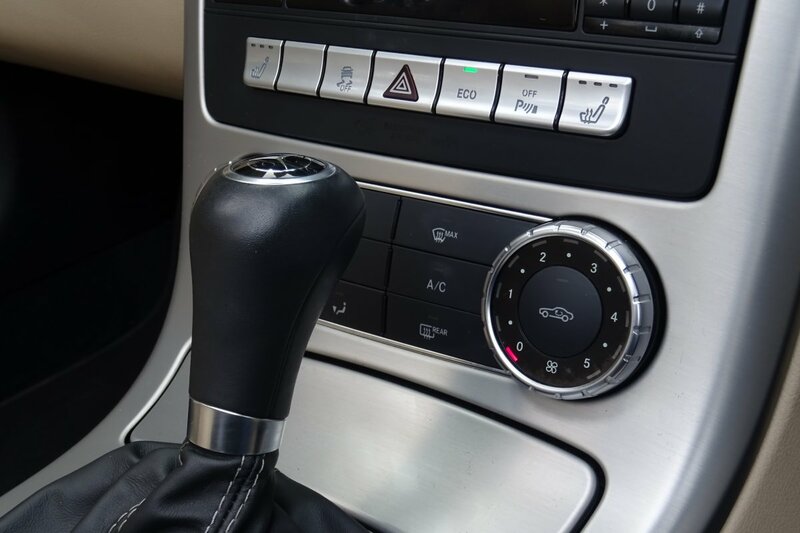 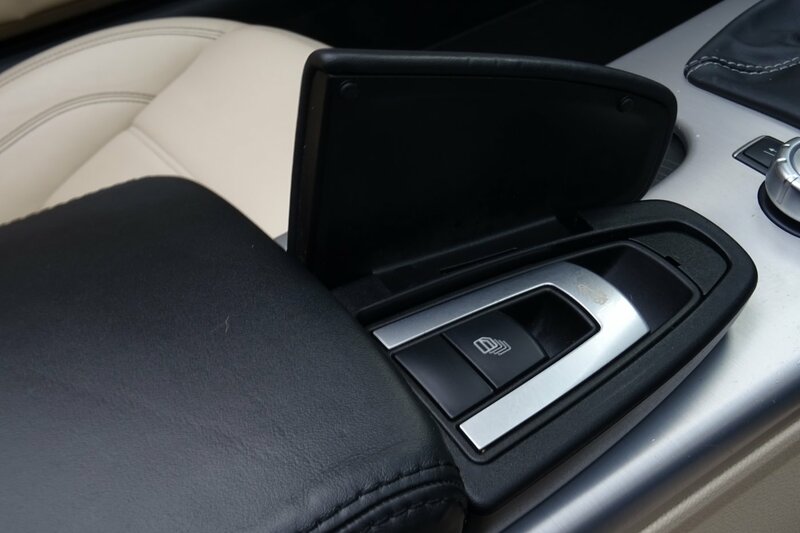 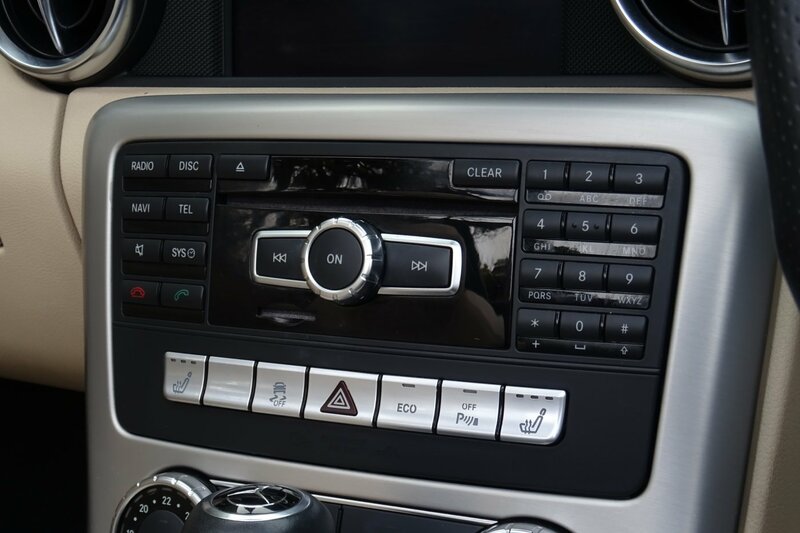 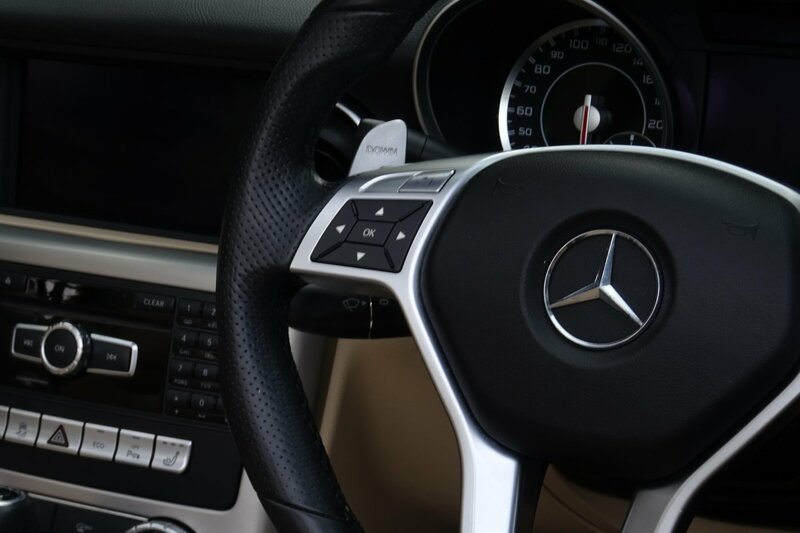 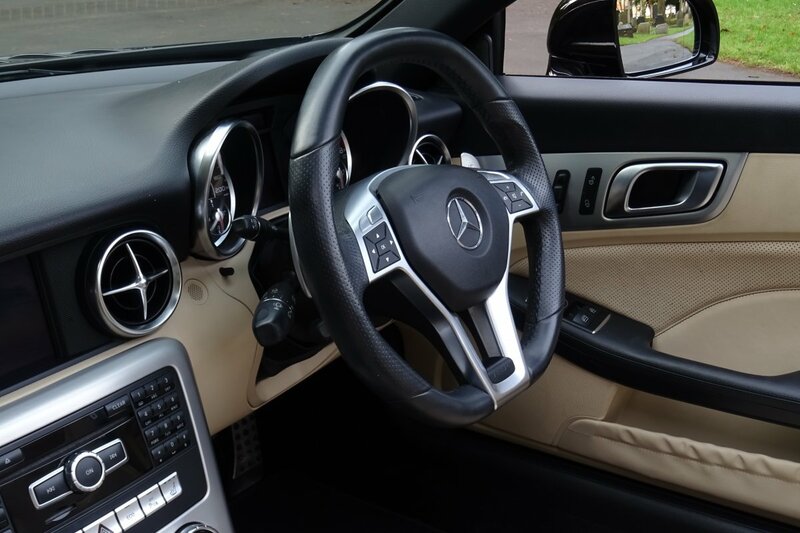 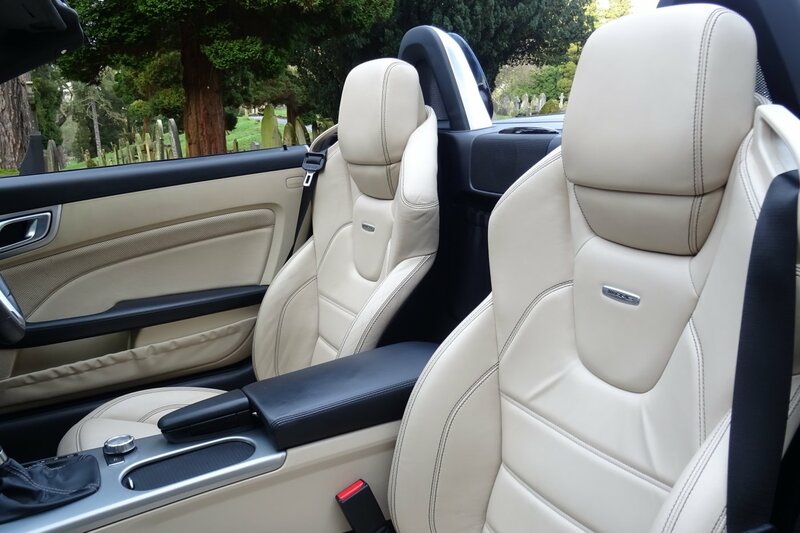 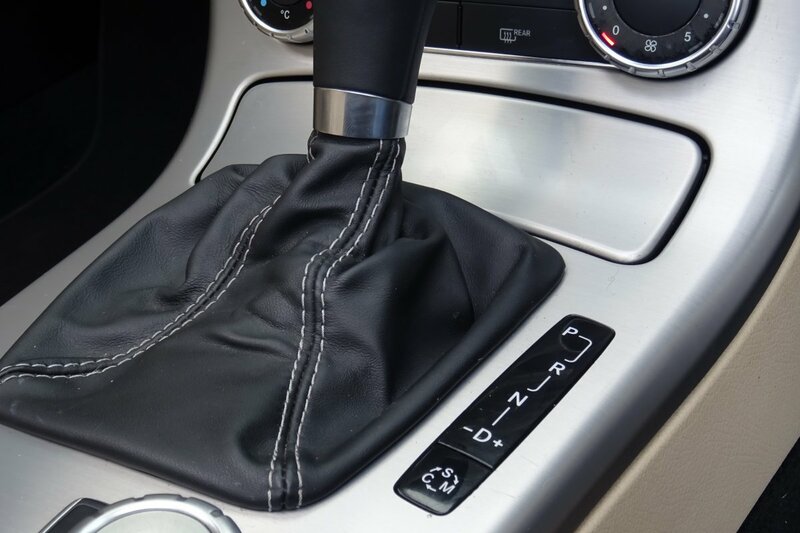 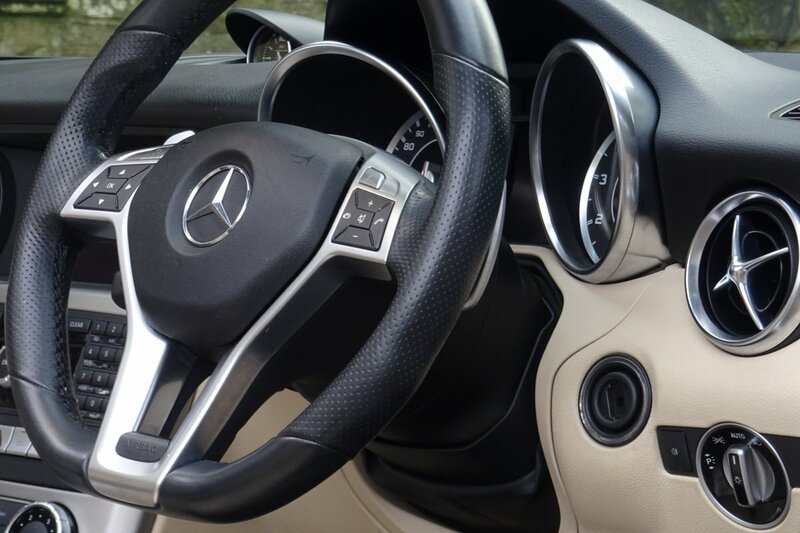 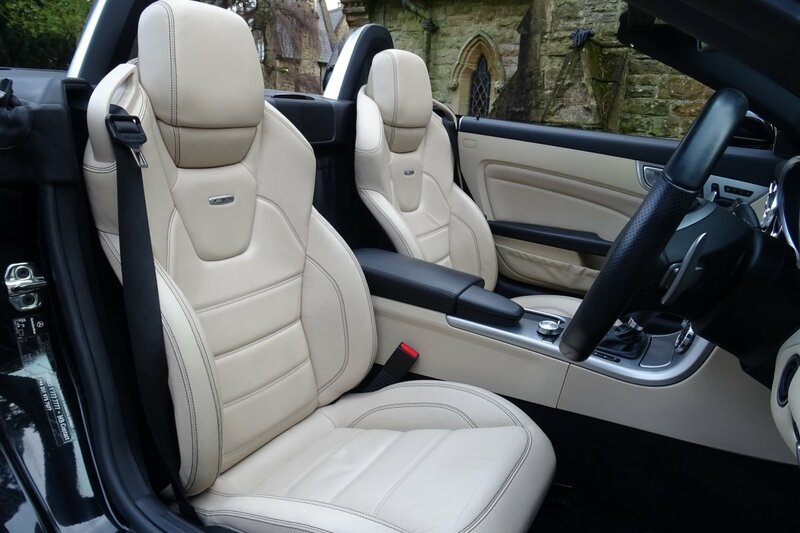 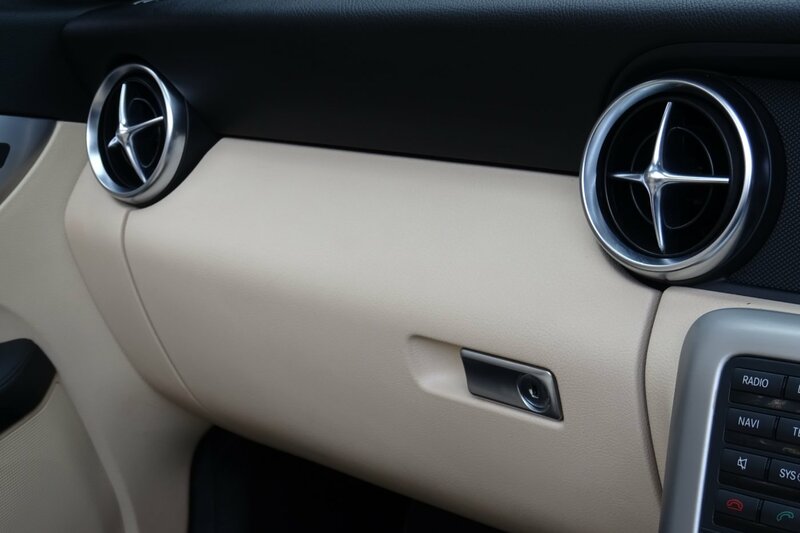 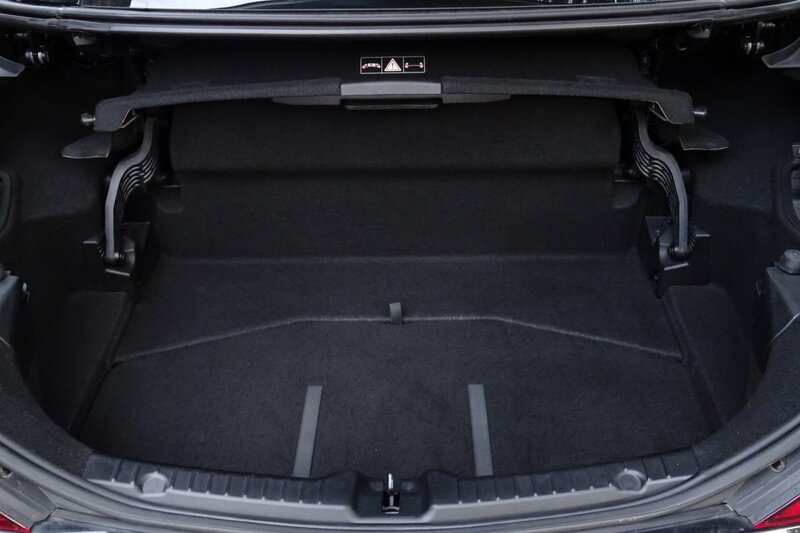 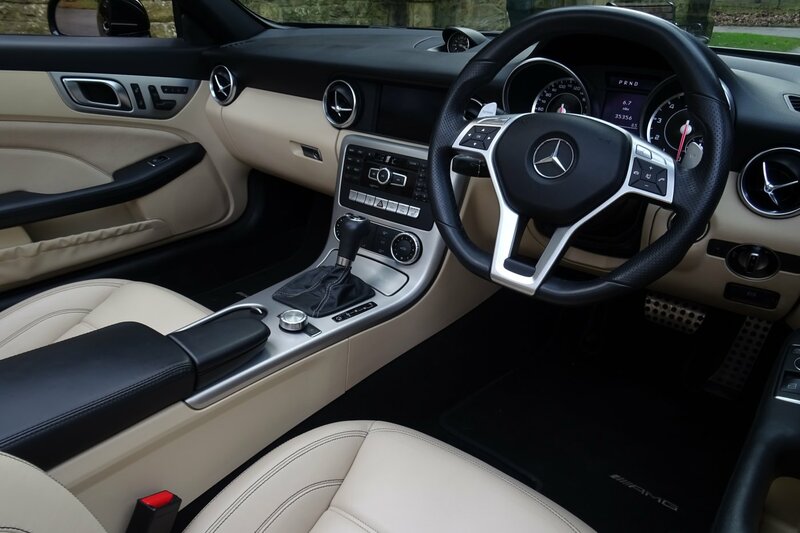 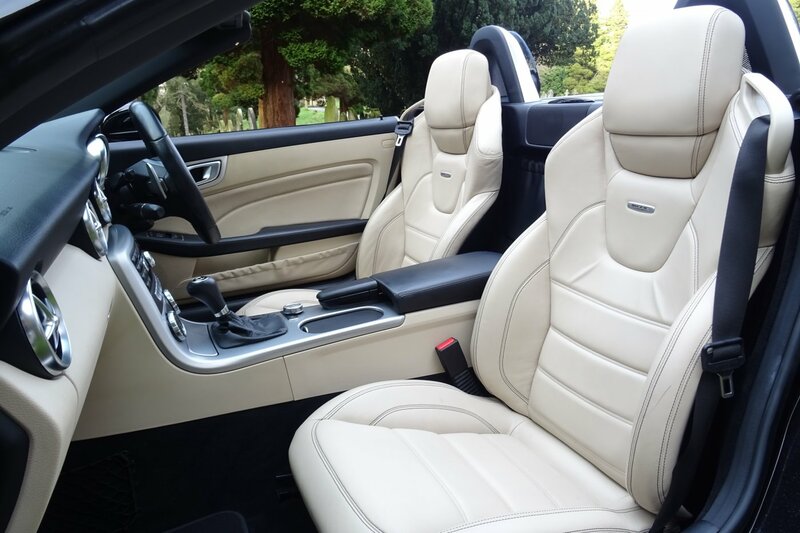 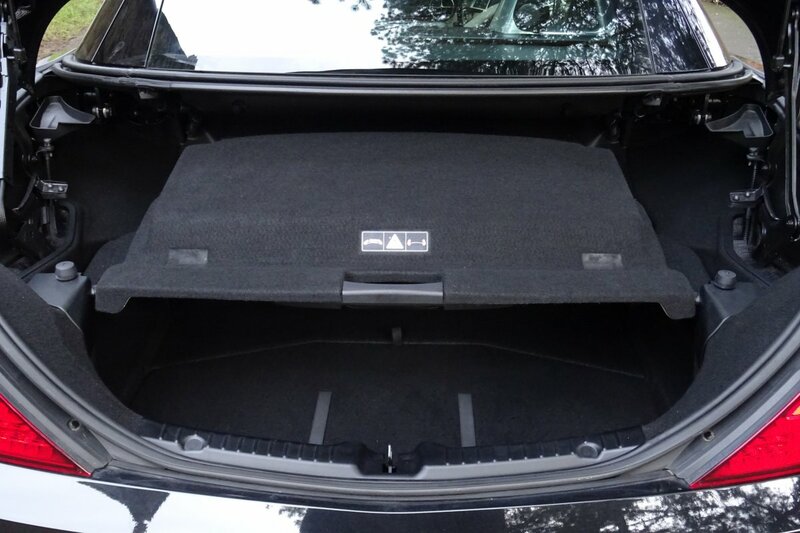 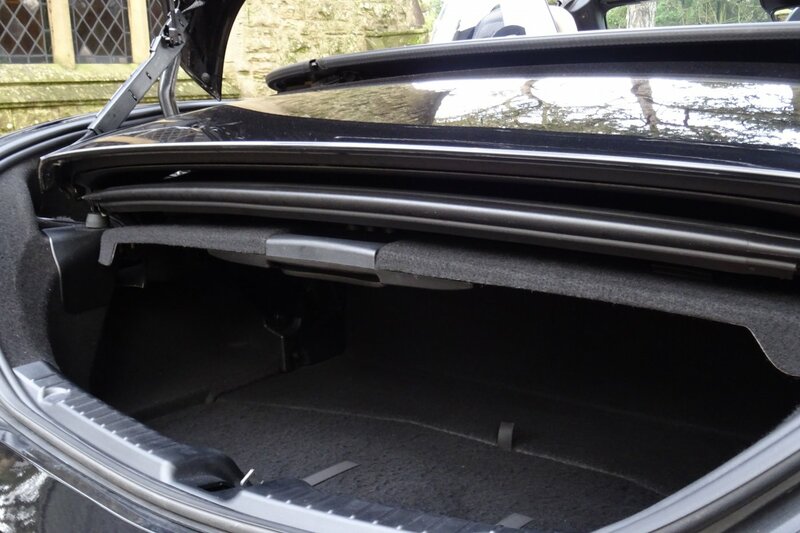 The Interior Offers A Truly Relaxed, Yet Exciting Place To Be Sat And Also Offers An Excellent Array Of Mercedes Benz Options, Meaning That Every Trip Can Be Tackled With Ease. 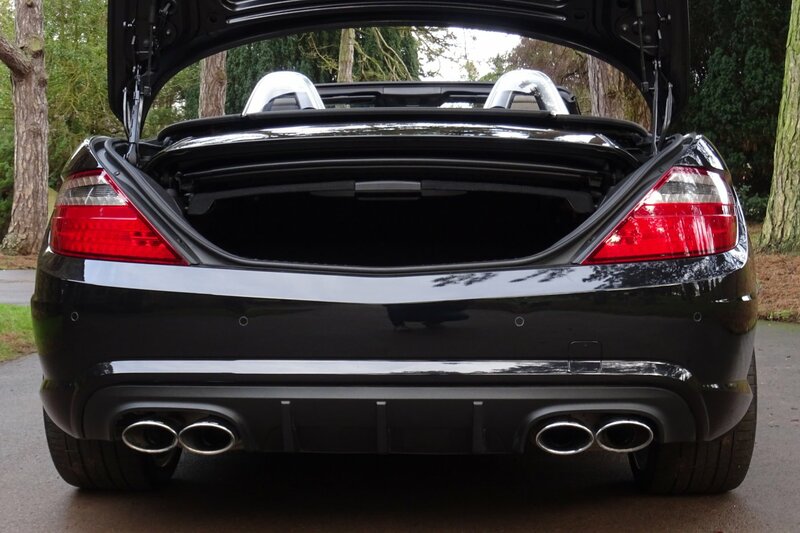 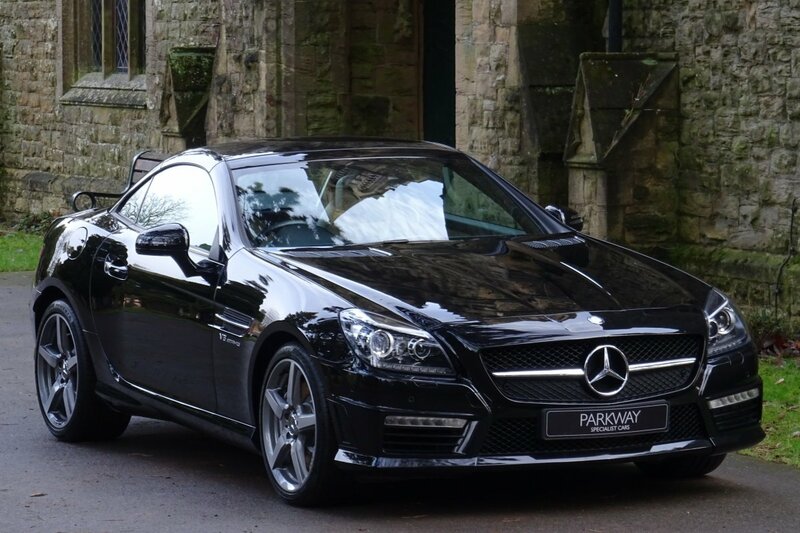 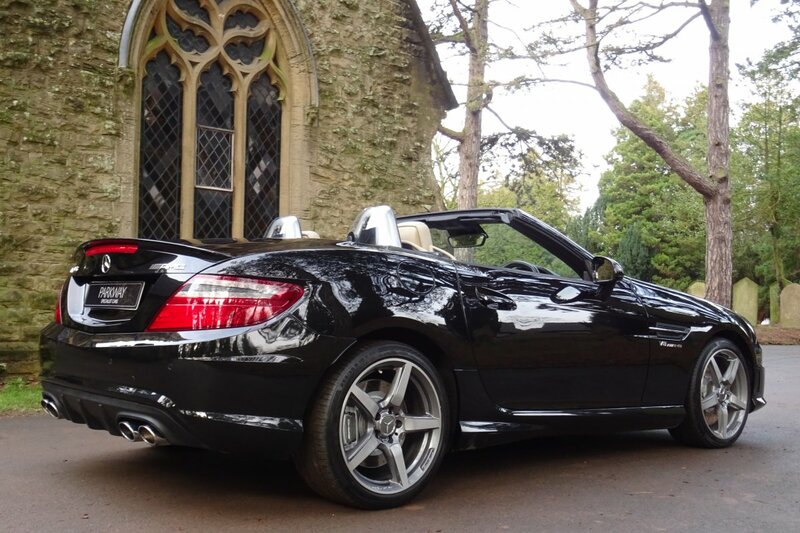 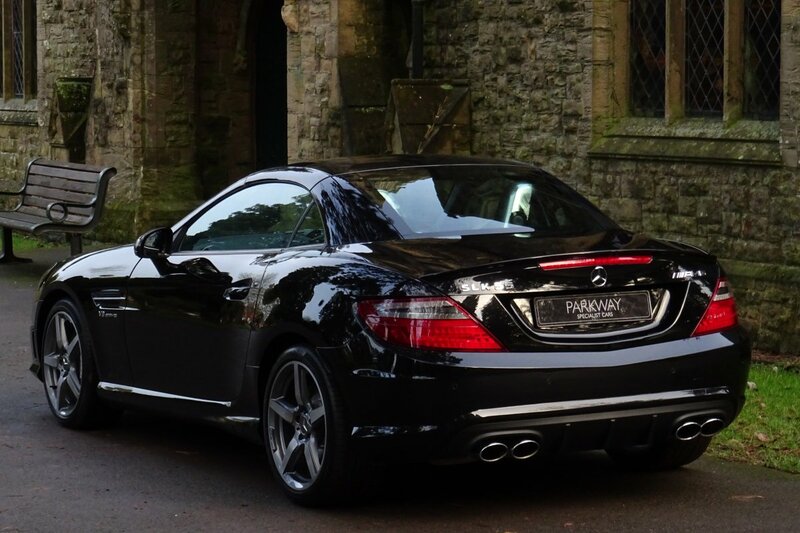 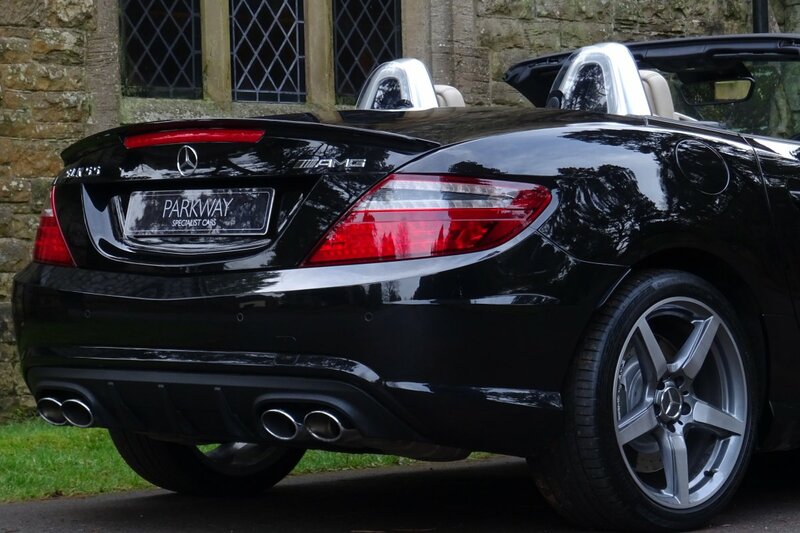 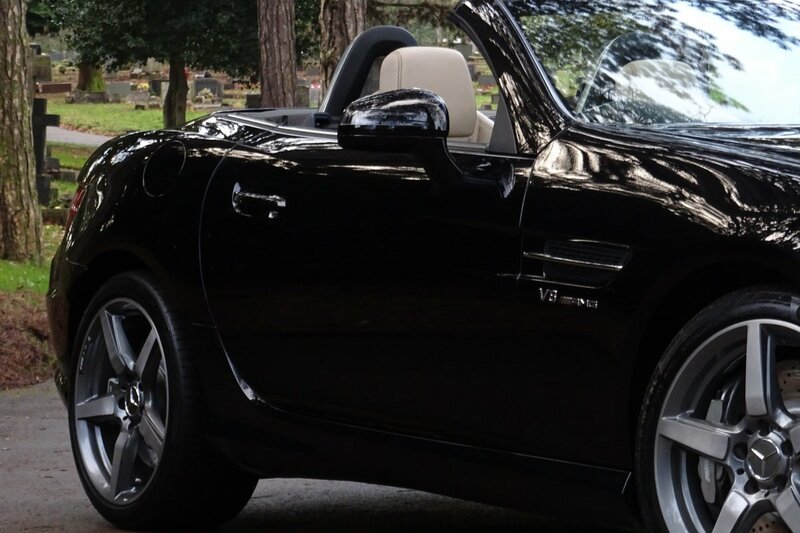 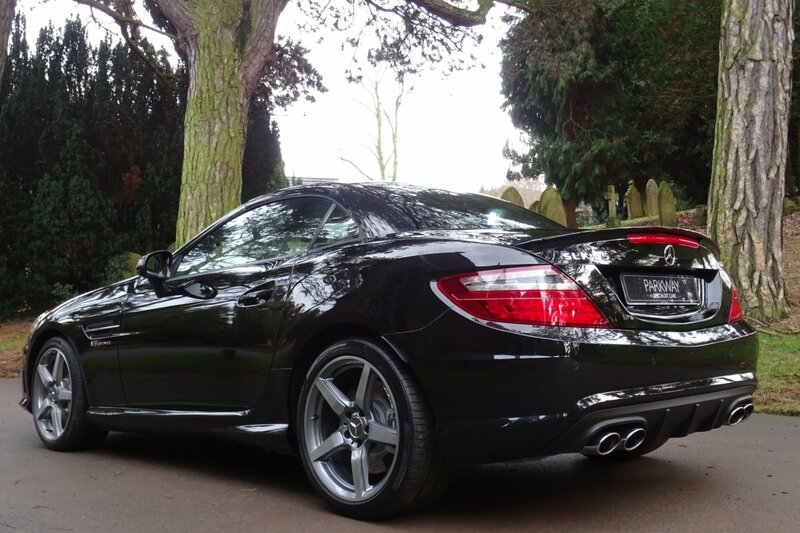 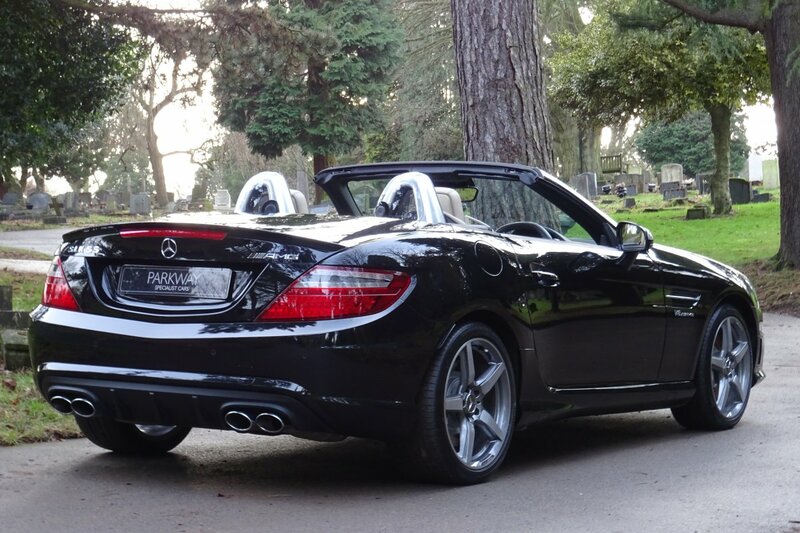 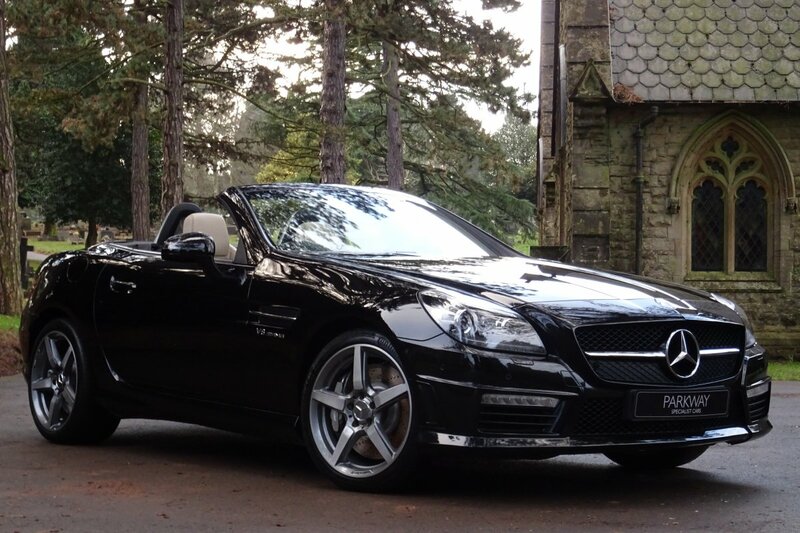 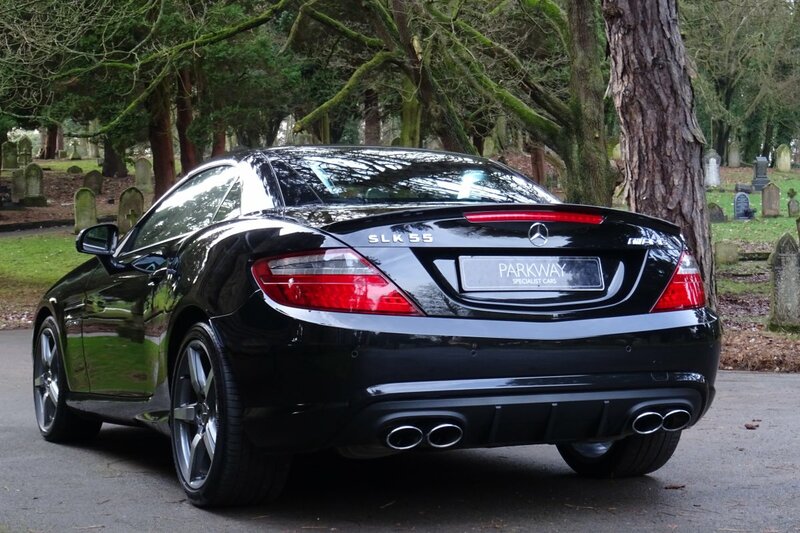 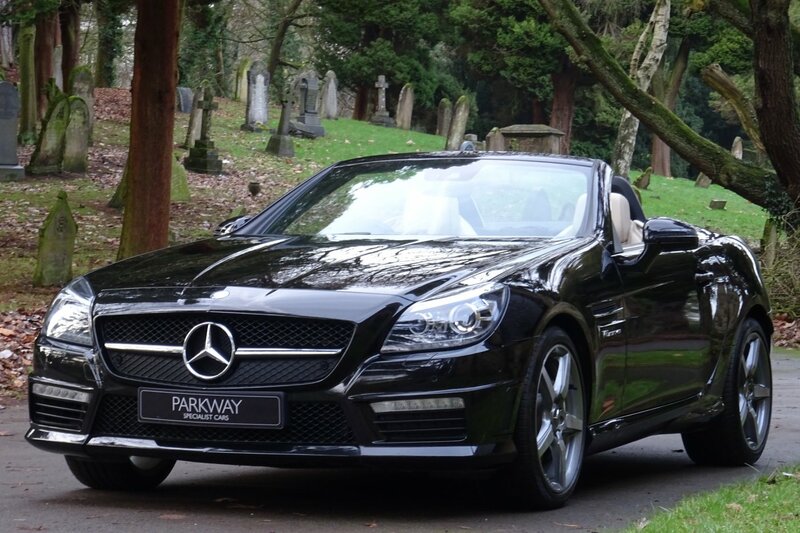 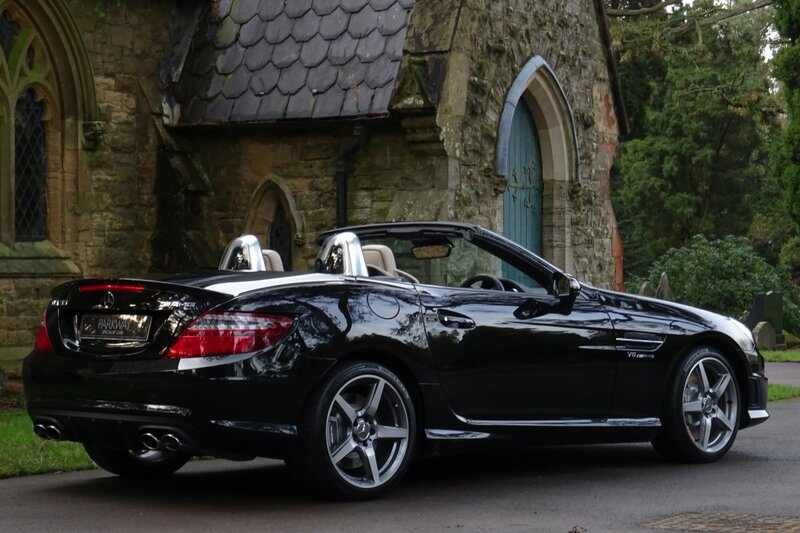 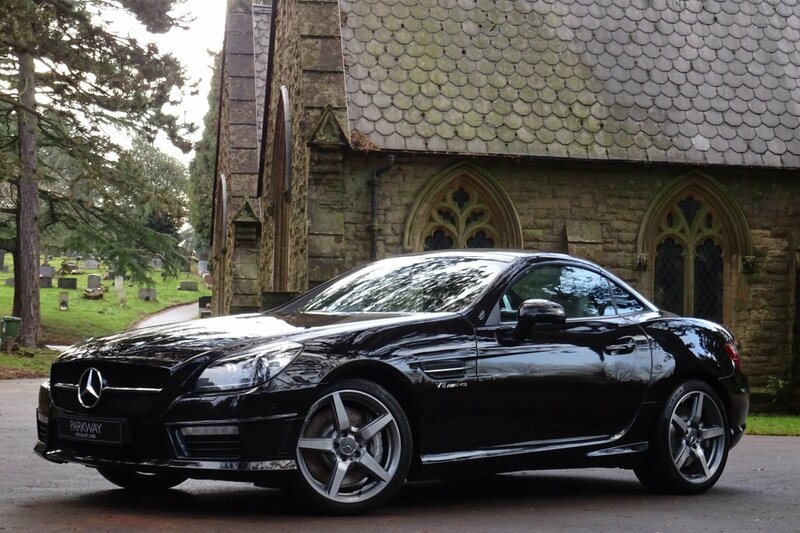 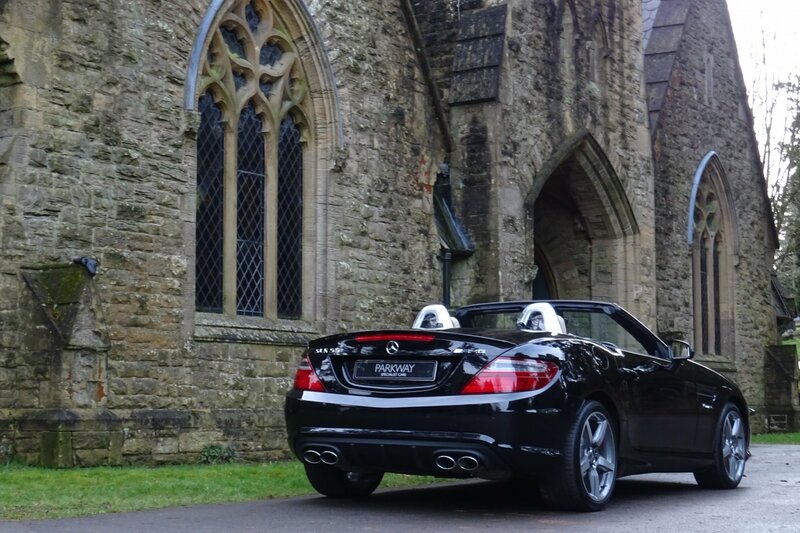 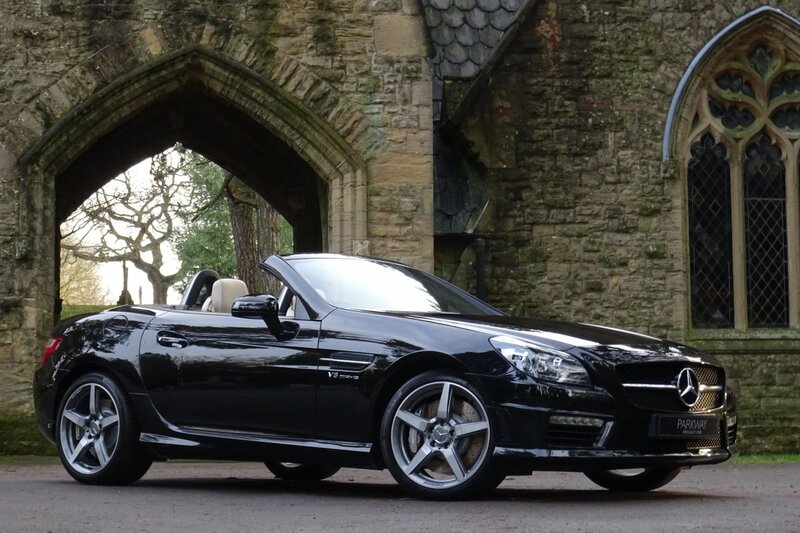 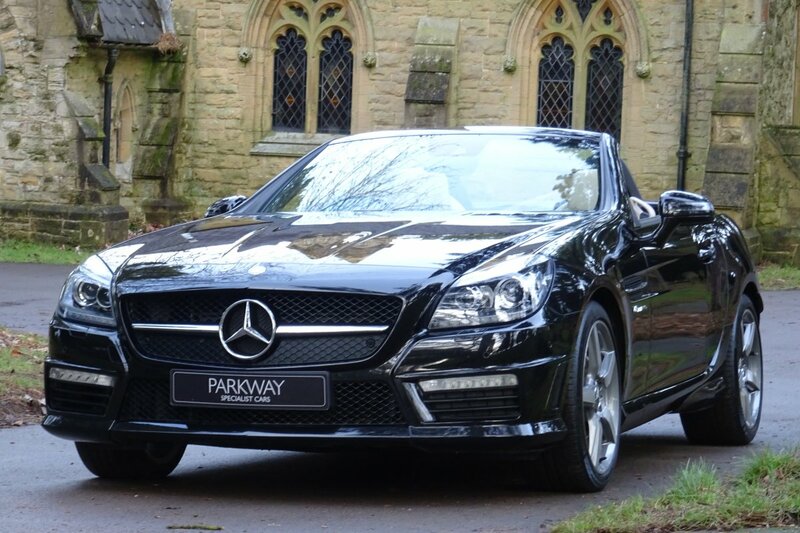 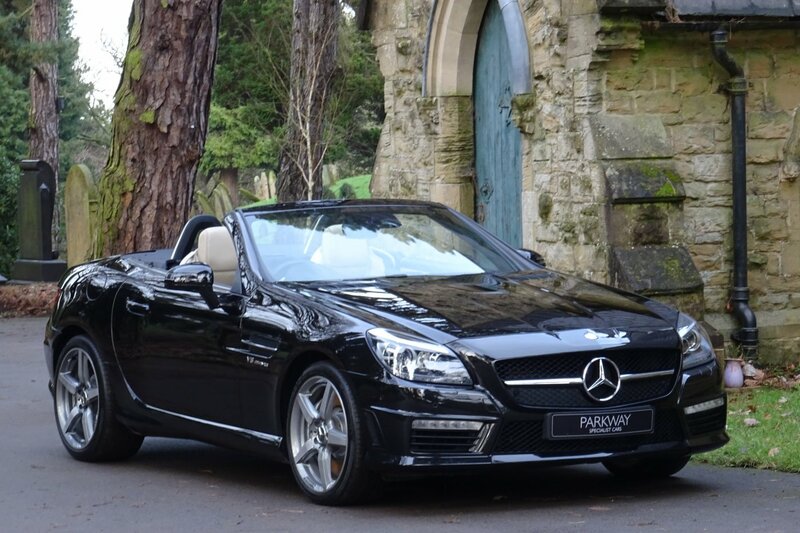 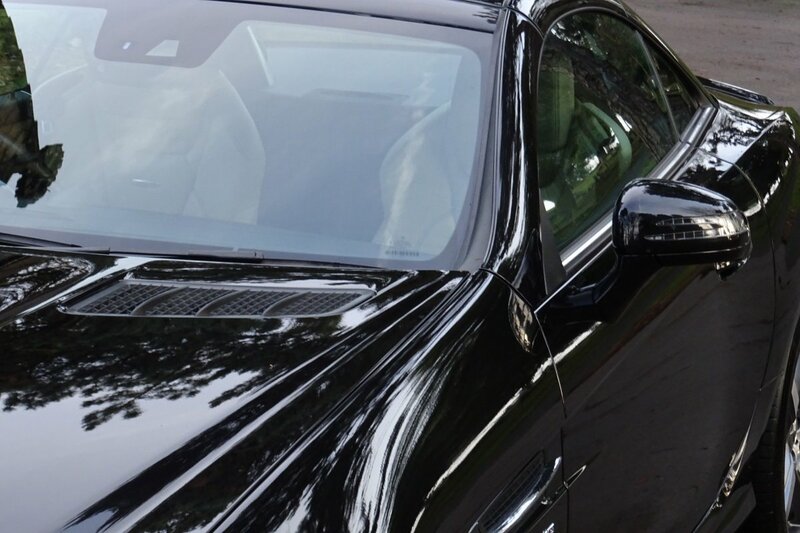 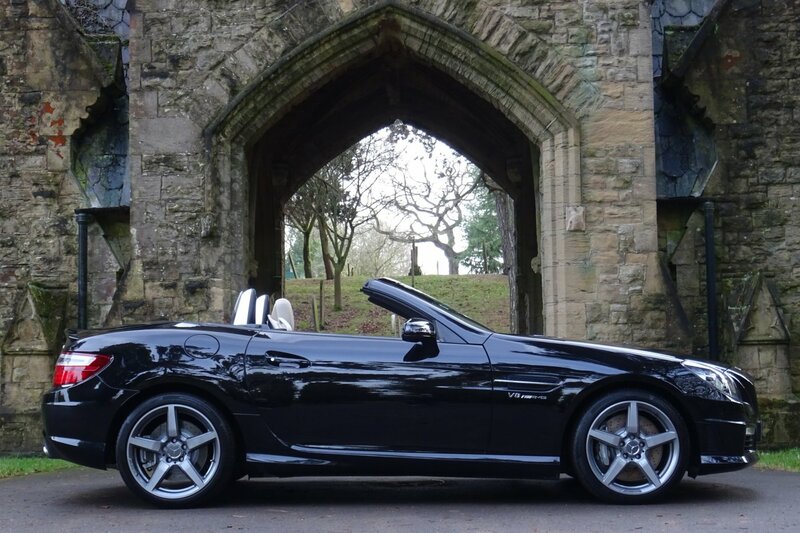 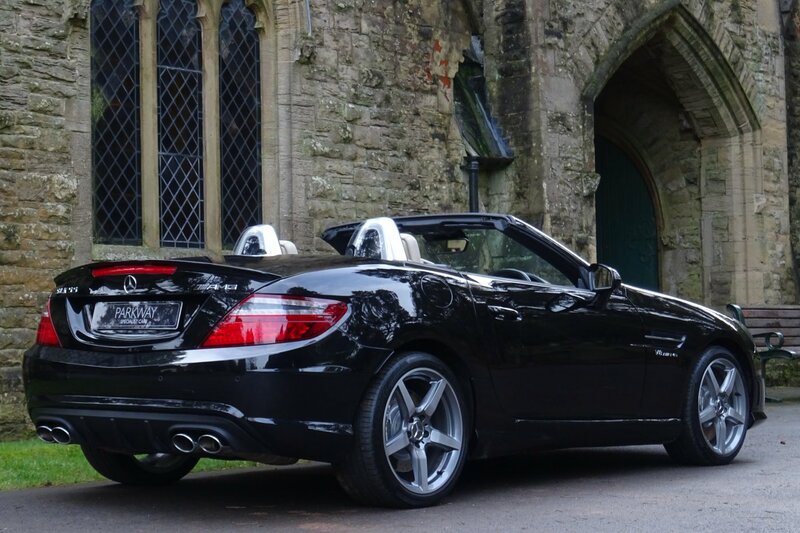 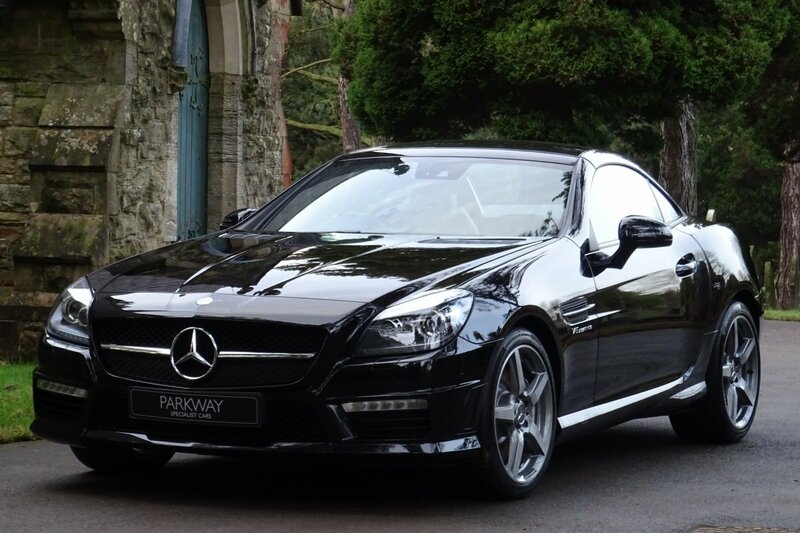 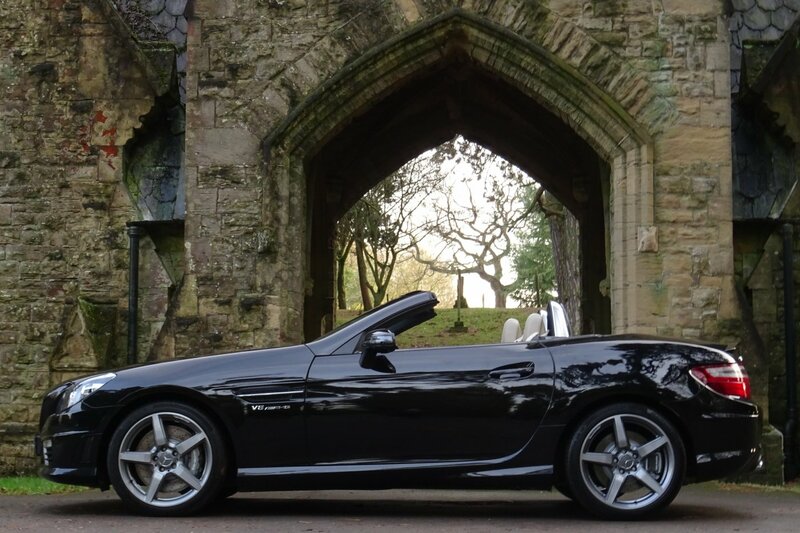 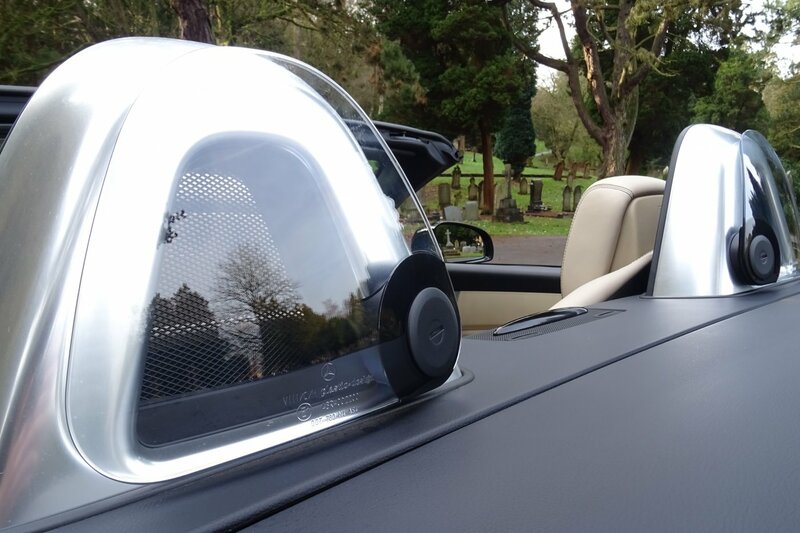 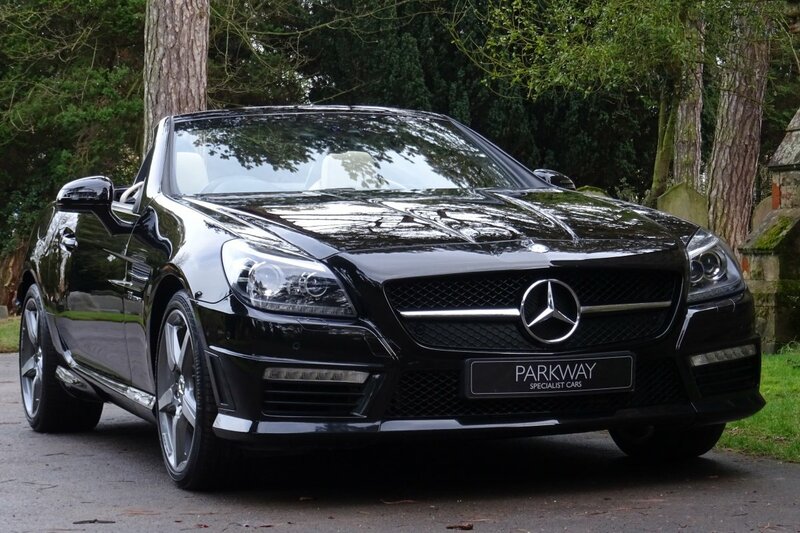 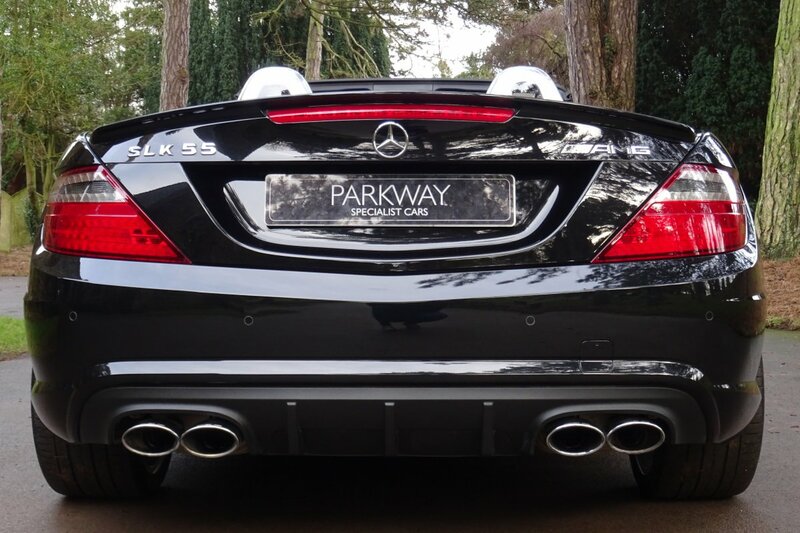 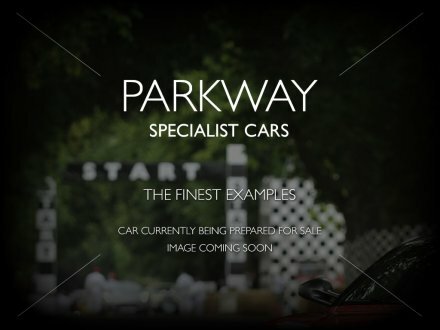 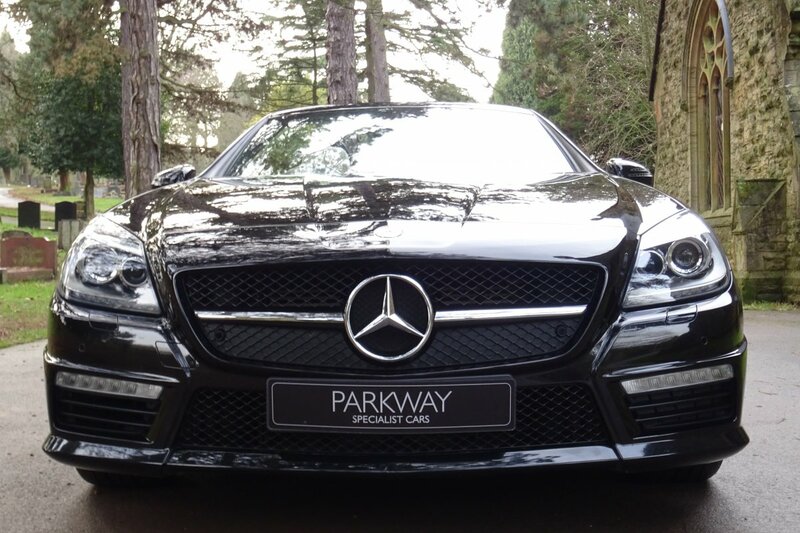 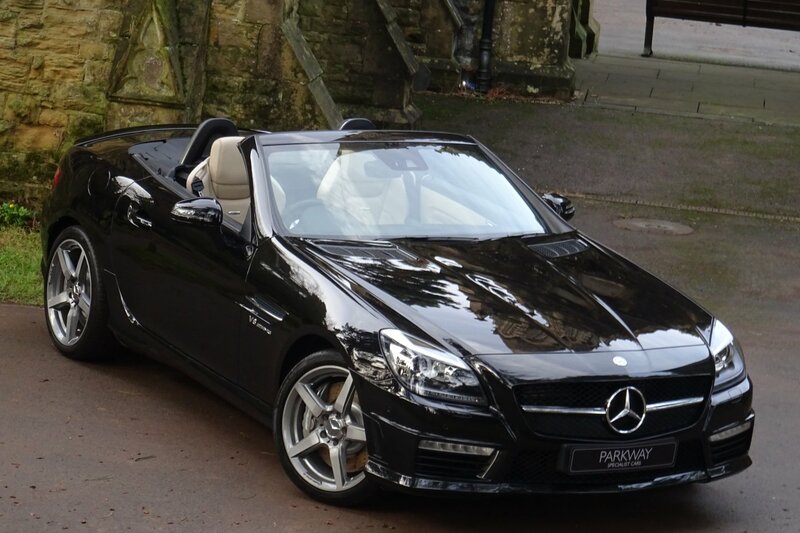 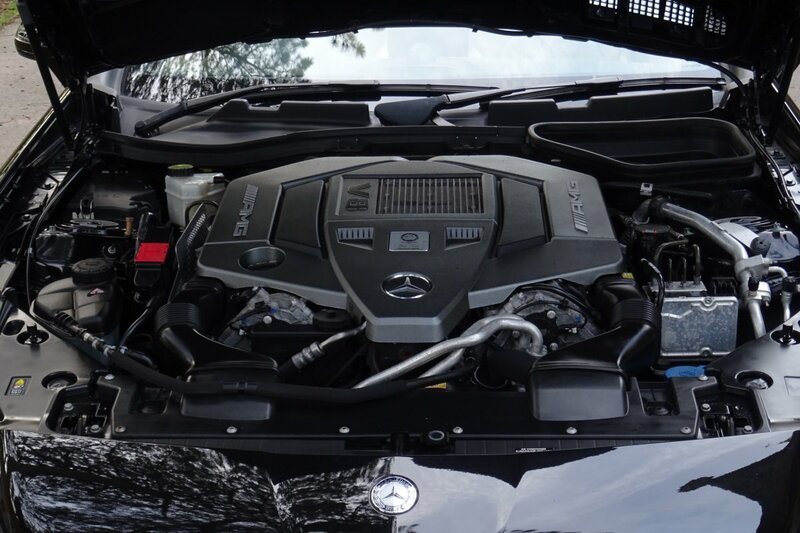 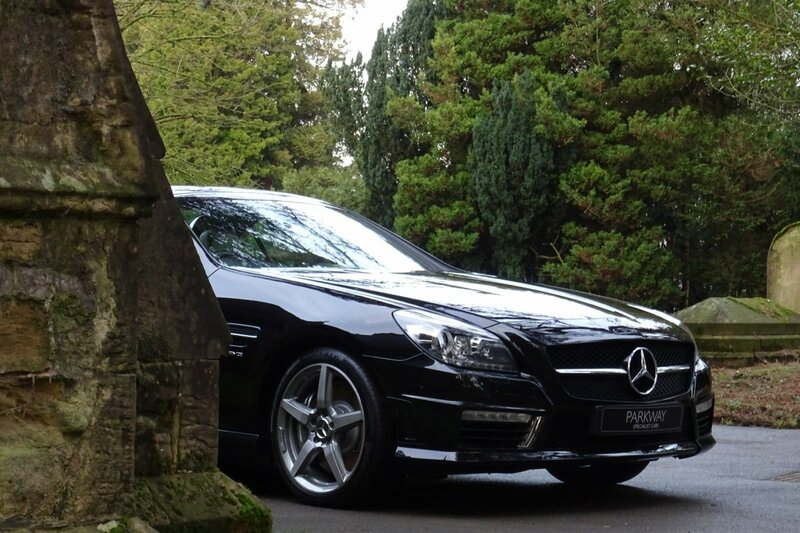 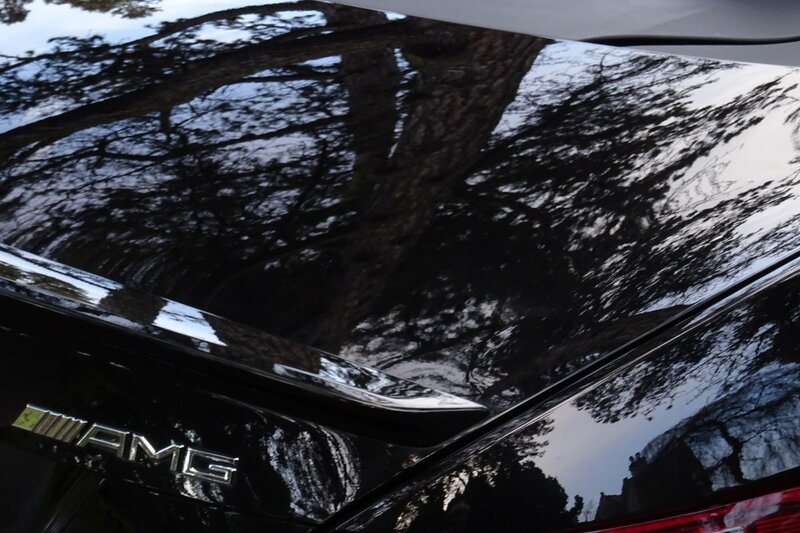 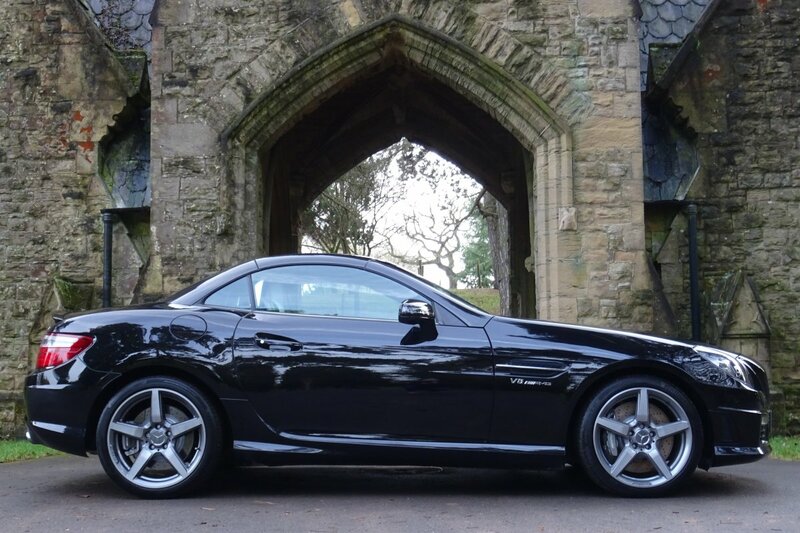 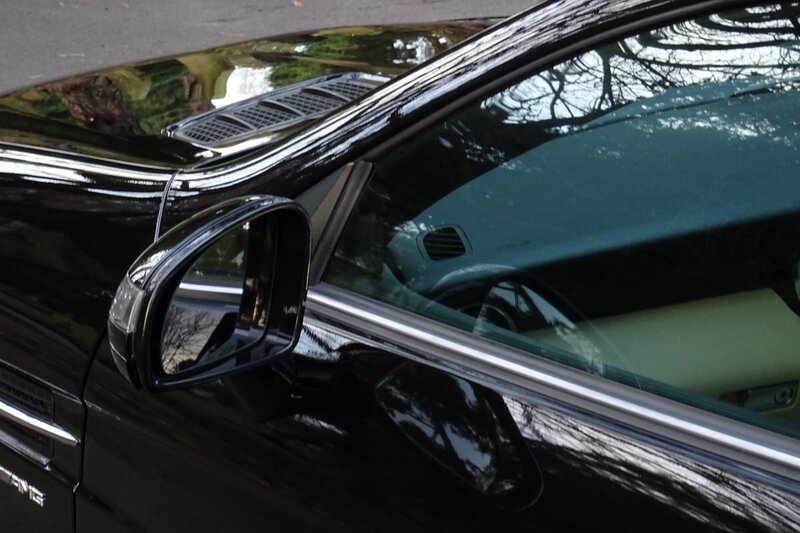 The Sculptured Body Is Presented In The Obsidian Black Metallic, Which Perfectly Demonstrates The Aggressive Mercedes Benz AMG Exterior Styling, The Distinctive SLK Lines And Looks Stunning With Or Without The Solid Folding Convertible Roof In Place. 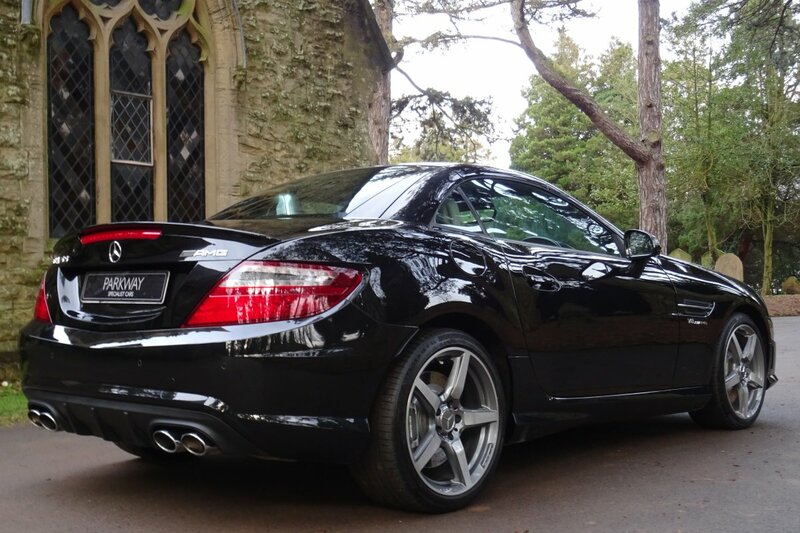 Further Exterior Treats Are Presented With The Unmarked 18" AMG 5-Spoke Alloy Wheels Which All Sit On Branded Tyres, A Gloss Black Hexagon Front Grille With The Chromed Three Pointed Star That Dominates The Nose, Chromed Tipped AMG Quad Exhaust Pipes, The Colour Coded Rear Boot Lip Spoiler, The Chromed Blades To The Front Wings Embossed With V8 AMG Motifs, A Blackened Bonnet Vents, The Colour Coded Front Bumper Air Dams, Further Colour Coded AMG Exterior Styling, The Dark Grey AMG Embossed Brake Calipers And Decorated With The Powerful Chromed AMG Badges, That Finalise This Aggressive Vehicle Stance. 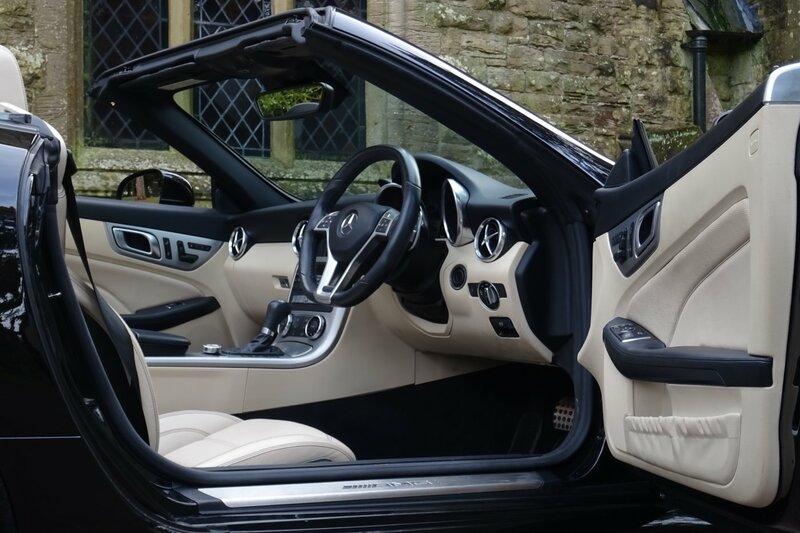 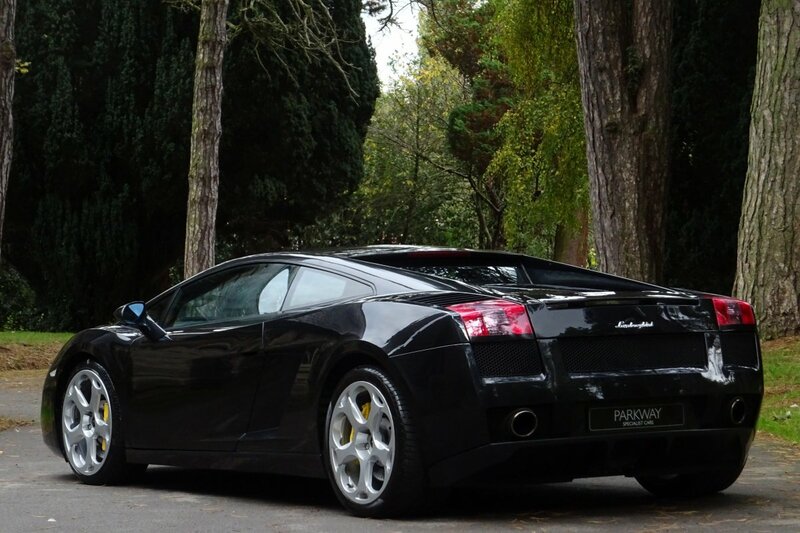 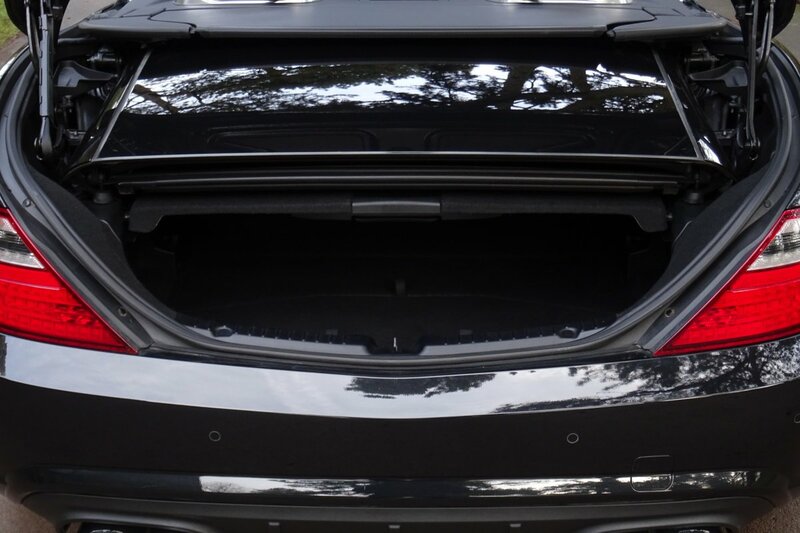 The Vehicle Looks Staggeringly Beautiful From Every Given Angle And With This Would Be Well Suited Outside A London Town House Or Travelling Through The Open European Countryside.